Welcome back to our blog series about the importance of calling professionals when it’s time to get your trees removed! In part one, we looked at some of the reasons that your general well-being is better off when the pros come. In this post, we’ll examine a few reasons why they’re just more qualified for the job, and why those qualifications are important. As tree experts in Shelby Townsend, we have the experience to back up these claims. When it comes to felling a tree, a lot of people are under the impression that you just need an axe and you’re set, or perhaps a chainsaw if they’re more current. Unfortunately, a chainsaw is only a drop in the water compared to all the equipment that’s often necessary. Cutting down a tree isn’t the only part of tree removal; it also involves cleaning up the giant mess that’s left, treating the hole where the roots come out, controlling where the tree falls down to, and more. Many of these tasks often involve heavy machinery. We’d feel safe betting on the idea that most homeowners don’t come close to having as much equipment as we’ve accumulated over the years. When you call a professional tree service, there will be no doubt that they have everything you need. Another differentiator between professional and amateur jobs is that tree services tend to have an entire team of people who are trained and qualified for tree removal. In a worst-case scenario, amateur jobs consist of one person, and even if they don’t, it’s usually not more than a few people (which can actually be an endangerment to them if you don’t know how to properly fell a tree). Everyone knows what to do when you call a tree service. They will coordinate together to make the job as seamless as possible, and they will have more eyes everywhere as to prevent accident, injury, or property damage. Finally, the one resource that tree services have that can’t be understated is their comprehensive knowledge. Too many homeowners end up cutting down a tree without really knowing the “why” behind it. They might not know why the tree got damaged or diseased, or the implications it has on the rest of their yard. They might not know that there are unseen problems happening underground. They might not know that what happens to one tree might be symptomatic of a much larger problem. There’s an endless amount of factors we could go on listing, but the point is that you’re getting more than just a tree removal when you call professionals—you can get a full diagnosis of what’s going on in your yard and what your other needs might be. This is invaluable knowledge that can also save you boatloads of money in the future. 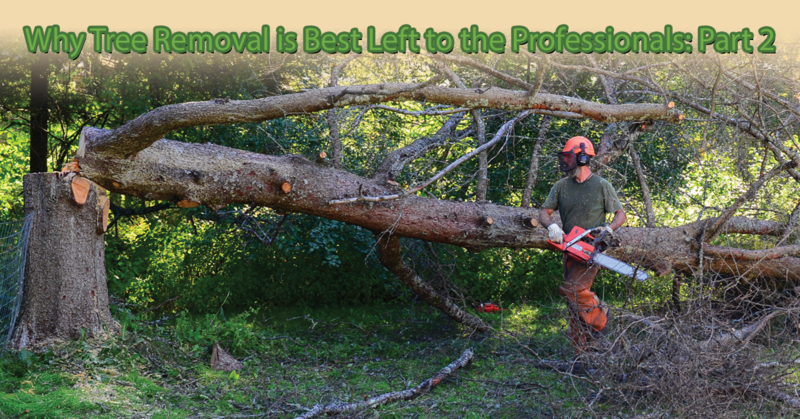 At Halo Tree Service, we’ve devoted our lives to learning how to professionally remove trees with expert care. This is a job we’re prepared to do for you, and we promise that, at the end of the day, you won’t regret enlisting our services. If you’re in or around the Shelby Townsend, please contact us today for a free quote.